10th day of Muharram in the Islamic calendar and marks the climax of the Remembrance of Muharram. It is commemorated by Shia Muslims as a day of mourning for the martyrdom of Husayn ibn Ali, the grandson of the Prophet Muhammad at the Battle of Karbala on 10 Muharram in the year 61 AH (October 2, 680 CE). According to Sunni Muslim tradition, Muhammad fasted on this day and asked other people to fast. Sunni Muslims also remember the day claiming that Moses fasted on that day to express gratitude to God for liberating the Israelites from Egypt. In some Shi'ite regions of Muslim countries such as Albania, Afghanistan, Iran, Iraq, Azerbaijan, Pakistan, Lebanon, and Bahrain, the Commemoration of Husayn ibn Ali has become a national holiday and most ethnic and religious communities participate in it. Even in predominantly Hindu country like India, Ashura (often called Moharram) is a public holiday. The root for the word ashura has the meaning of tenth in Semitic languages; hence the name of the remembrance, literally translated, means "the tenth day". According to the orientalist A.J. Wensinck, the name is derived from the Hebrew ʿāsōr, with the Aramaic determinative ending. The day is indeed the tenth day of the month, although some Islamic scholars offer up different etymologies. In his book Ghuniyatut Talibin, Sheikh Abdul Qadir Jilani writes that the Islamic scholars have a difference of opinion as to why this day is known as Ashura, with some scholars suggesting that this day is the tenth most important day that God has blessed Muslims with. This day is well-known because of mourning for the martyrdom of Husayn ibn Ali, the grandson of Muhammad and the third Shia Imam, along with members of his family and close friends at the Battle of Karbala in the year 61 AH (680 CE). Yazid I was in power then and wanted the Bay'ah (allegiance) of Husayn ibn Ali. Muslims believe Yazid was openly going against the teachings of Islam in public and changing the sunnah of Muhammad. Husayn in his path toward Kufa encountered the army of Ubayd-Allah ibn Ziyad, the governor of Kufa. On October 10, 680 (Muharram 10, 61 AH), he and his small group of companions and family members, who were between 72 men  fought with a large army of perhaps more than 100,000 men under the command of Umar ibn Sa'ad, son of the founder of Kufa. Husayn and all of his men were killed. Before he died, he said "if the religion of Mohammad was not going to live on except with me dead, let the swords tear me to pieces. "[unreliable source?]. Some of the bodies of the dead, including that of Husayn, were then mutilated. Commemoration for Husayn ibn Ali began after the Battle of Karbala. After the massacre, the Umayyad army looted Husayn's camp and set off with his women and children for the court of Ibn Ziyad. A moving oration delivered by Zaynab in Kufa is recorded in some sources. The prisoners were next sent to the court of Yazid, Umayyad caliph, in Damascus, where one of his Syrian followers asked for Husayn's daughter Faṭimah al-Kubra, and once again it was Zaynab who came to the rescue and protected her honour. The family remained in Yazid's prison for a time. The first assembly (majlis) of Commemoration of Husayn ibn Ali is said to have been held by Zaynab in prison. In Damascus, too, she is reported to have delivered a poignant oration. The prison sentence ended when Husayn's 3 year old daughter, Janabe Rukaiyya, died in captivity, unaware of her father's martyrdom. She often cried in prison to be allowed to see her father. She is believed to have passed away when she saw her fathers mutilated head. Her death caused an uproar in the city, and Yazid, fearful of a potential resulting revolution, freed the captives. "Zaynab bint Ali quoted as she passed the prostrate body of her brother, Husayn. " O Muhammad! O Muhammad! May the angels of heaven bless you. Here is Husayn in the open, stained with blood and with limbs torn off. O Muhammad! Your daughters are prisoners, your progeny are killed, and the east wind blows dust over them." By God! She made every enemy and friend weep." Tabari, History of the Prophets and Kings, Volume XIX The Caliphate of Yazid. Husayn's grave became a pilgrimage site among Shi'a only a few years after his death. A tradition of pilgrimage to the Imam Husayn Shrine and the other Karbala martyrs quickly developed, which is known as Ziarat Ashura. The Umayyad and Abbasid caliphs tried to prevent construction of the shrines and discouraged pilgrimage to the sites. The tomb and its annexes were destroyed by the Abbasid caliph Al-Mutawakkil in 850-851 and Shi'a pilgrimage was prohibited, but shrines in Karbala and Najaf were built by the Buwayhid emir 'Adud al-Daula in 979-80. Public rites of remembrance for Husayn's martyrdom developed from the early pilgrimages. Under the Buyid dynasty, Mu'izz ad-Dawla officiated at public commemoration of Ashura in Baghdad. These commemorations were also encouraged in Egypt by the Fatimid caliph al-'Aziz. From Seljuq times, Ashura rituals began to attract participants from a variety of backgrounds, including Sunnis. With the recognition of Twelvers as the official religion by the Safavids, Mourning of Muharram extended throughout the first ten days of Muharram. Taziya procession carried out by Shiite Muslims in Indian town of Hallaur on the Day of Ashura. Shi'a devotees congregate outside the Sydney Opera House, Australia to commemorate Husayn. This day is of particular significance to Shi'a and Alawite Muslims, who consider Husayn (the grandson of Muhamad) Ahl al-Bayt the third Imam and the rightful successor of Muhammad. Shi'as make pilgrimages on Ashura, as they do forty days later on Arba'een, to the Mashhad al-Husayn, the shrine in Karbala, Iraq that is traditionally held to be Husayn's tomb. On this day Shi'a are in remembrance, and mourning attire is worn. They refrain from music, since Arabic culture generally considers music impolite during death rituals. It is a time for sorrow and respect of the person's passing, and it is also a time for self-reflection, when one commits oneself to the mourning of the Husayn completely. Weddings and parties are also never planned on this date by Shi'as. Shi'as also express mourning by crying and listening to poems about the tragedy and sermons on how Husayn and his family were martyred. This is intended to connect them with Husayn's suffering and martyrdom, and the sacrifices he made to keep Islam alive. Husayn's martyrdom is widely interpreted by Shi'a as a symbol of the struggle against injustice, tyranny, and oppression. Shi'a Muslims in Malir, Pakistan performing zanjeer--ritual flagellation. Shi'as believe the Battle of Karbala was between the forces of good and evil with Husayn representing good while Yazid represented evil. Shi'as also believe the Battle of Karbala was fought to keep the Muslim religion untainted of any corruptions and they believed the path that Yazid was directing Islam was definitely for his own personal greed. Shia Imams strongly insist that the day of Ashura should not be taken as a day of joy and festivity. According to a hadith which is reported from Ali some people fabricated a hadith claiming it was on that day the God forgave Adam, Noah's Ark rested on dry land, The Israelites were saved from Pharaoh's army, etc. The day of Ashura, according to Eighth Shia Imam, Ali al-Rida, must be observed as a day of inactivity, sorrow and total disregard of worldly cares. Some of the events associated with Ashura are held in special congregation halls known as "Imambargah" and Hussainia. As suffering and cutting the body with knives or chains (matam) have been prohibited by Shi'a marjas like Ali Khamenei, Supreme Leader of Iran, some Shi'a observe mourning with blood donation which is called "Qame Zani" and flailing. Yet some Shi'ite men and boys, considered heretics by some Muslim scholars, slash themselves with chains(zanjeer) or swords (talwar) and allow their blood to run freely. Certain rituals like the traditional flagellation ritual called Talwar zani (talwar ka matam or sometimes tatbir) using a sword or zanjeer zani or zanjeer matam, involving the use of a zanjeer (a chain with blades) are also performed. These are religious customs that show solidarity with Husayn and his family. People mourn the fact that they were not present at the battle to fight and save Husayn and his family. Indian Shia Muslims take out a Ta'ziya procession on day of Ashura in Barabanki, India, Jan, 2009. Shia Muslims take out an Al'am procession on day of Ashura in Barabanki, India, Jan, 2009. For Shi'as, commemoration of Ashura is not a festival, but rather a sad event, while Sunni Muslims view it as a victory God has given to his prophet, Moses. This victory is the very reason, as Sunni Muslims believe, Muhammad mentioned when recommending fasting on this day. For Shi'as, it is a period of intense grief and mourning. Mourners, congregate at a Mosque for sorrowful, poetic recitations such as marsiya, noha, latmiya and soaz performed in memory of the martyrdom of Husayn, lamenting and grieving to the tune of beating drums and chants of "Ya Hussain." Also Ulamas give sermons with themes of Husayn's personality and position in Islam, and the history of his uprising. The Sheikh of the mosque retells the Battle of Karbala to allow the listeners to relive the pain and sorrow endured by Husayn and his family. In Arab countries like Iraq and Lebanon they read Maqtal Al-Husayn. In some places, such as Iran, Iraq and the Arab states of the Persian Gulf, Ta'zieh, passion plays, are also performed reenacting the Battle of Karbala and the suffering and martyrdom of Husayn at the hands of Yazid. Tabuiks being lowered in to the sea in Pariaman, Indonesia, by Shia Muslims. For the duration of the remembrance, it is customary for mosques and some people to provide free meals (Niazz) on certain nights of the month to all people. People donate food and Middle Eastern sweets to the mosque. These meals are viewed as being special and holy, as they have been consecrated in the name of Husayn, and thus partaking of them is considered an act of communion with God, Hussain, and humanity. Participants congregate in public processions for ceremonial chest beating (matham/latmiya) as a display of their devotion to Husayn, in remembrance of his suffering and to preach that oppression will not last in the face of truth and justice. Others pay tribute to the time period by holding a Majilis, Surahs from the Quran and Maqtal Al-Husayn are read. Today in Indonesia, the event is known as Tabuik (Minangkabau language) or Tabut (Indonesian). Tabuik is the local manifestation of the Shi'a Muslim Remembrance of Muharram among the Minangkabau people in the coastal regions of West Sumatra, particularly in the city of Pariaman. The festival includes reenactments of the Battle of Karbala, and the playing of tassa and dhol drums. In countries like Turkey, there is the custom of eating Noah's Pudding (Ashure) as this day in Turkish is known as Aşure. In some countries other religious communities commemorate this event. In Trinidad and Tobago and Jamaica all ethnic and religious communities participate in this event, locally known as "Hosay" or "Hussay", from "Husayn". Not related to Ashura and Karbala, some Sunni Muslims fast on this day of Ashura based on narrations attributed to Prophet Muhammad. The fasting is to commemorate the day when Moses and his followers were saved from Pharaoh by Allah by creating a path in the Red Sea. According to Muslim tradition, the Jews used to fast on the 10th day. So Muhammad recommended to be different from the Jews and recommended fasting two days instead of one. 9th and 10th or the 10th and 11th day of Muharram. According to Hadith record in Sahih Bukhari, Ashura was already known as a commemorative day during which some Meccans used to observe customary fasting. In hijrah event when Muhammad led his followers to Medina, he found the Jews of that area likewise observing fasts on the day of Ashura. At this, Muhammad affirmed the Islamic claim to the fast, and from then the Muslims have fasted on combinations of two or three consecutive days including the 10th of Muharram (e.g. 9th and 10th or 10th and 11th). A companion of Muhammed, Ibn Abas reports Muhammed went to Medina and found the Jews fasting on the tenth of Muharram. Muhammed inquired of them, "What is the significance of this day on which you fast?" They replied, "This is a good day, the day on which God rescued the children of Israel from their enemy. So, Moses fasted this day." Muhammed said, "We have more claim over Moses than you." Muhammed then fasted on that day and ordered Muslims too. The Israelites were saved from Pharaoh's army. Jesus was brought up to heaven after attempts by the Romans to capture and crucify him failed. Not all of the above incidents are confirmed to have taken place on Ashura in the Quran, nor by any strong Hadith. These have been reported in the weaker Hadith, but are nevertheless regarded possible by some of the Sunni Muslims. However many Islamic scholars like Mufti Taqi Uthmani[who?] rebuke such beliefs saying that "there are some legends and misconceptions with regard to 'Ashura' that have managed to find their way into the minds of the ignorant, but have no support of authentic Islamic sources". The narrations of Muhammad mentioning the Children of Israel being saved from Pharaoh are indeed confimed by authentic hadith in Sahih Bukhari and Sahih Muslim. Today, some Sunnis regard fasting during Ashura as recommended, though not obligatory, having been superseded by the Ramadan fast. Sunnis in Egypt customarily eat a pudding (also known as Ashura) after dinner on the Day of Ashura; it is a wheat pudding with nuts, raisins, and rose water, and it is also known in Turkish as Aşure. Commemoration of Ashura has great socio-political value for the Shi'a, who have been a minority throughout their history. 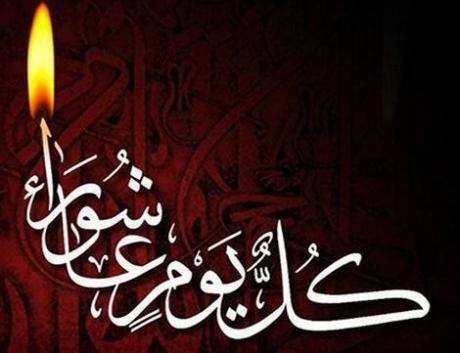 "Al-Amd" asserts that the Shi'a transference of Al-Husayn and Karbala ' from the framework of history to the domain of ideology and everlasting legend reflects their marginal and dissenting status in Arab-Islamic society. [original research?] According to the prevailing conditions at the time of the commemoration, such reminiscences may become a framework for implicit dissent or explicit protest. It was, for instance, used during the Islamic Revolution of Iran , the Lebanese Civil War, the Lebanese resistance against the Israeli occupation and in the 1990s Uprising in Bahrain. Sometimes the `Ashura' celebrations associate the memory of Al-Husayn's martyrdom with the conditions of Islam and Muslims in reference to Husayn's famous quote on the day of Ashura: "Every day is Ashura, every land is Karbala". From the period of the Iranian Constitutional Revolution (1905–11) onward, mourning gatherings increasingly assumed a political aspect. Following an old established tradition, preachers compared the oppressors of the time with Imam Hosayn's enemies, the umayyads. The political function of commemoration was very marked in the years leading up to the Islamic Revolution of 1978-79, as well as during the revolution itself. In addition, the implicit self-identification of the Muslim revolutionaries with Imam Hosayn led to a blossoming of the cult of the martyr, expressed most vividly, perhaps, in the vast cemetery of Behesht-e Zahra, to the south of Tehran, where the martyrs of the revolution and the war against Iraq are buried. On the other hand some governments have banned this commemoration. In 1930s Reza Shah forbade it in Iran. The regime of Saddam Hussein saw this as a potential threat and banned Ashura commemorations for many years. In the 1884 Hosay Massacre, 22 people were killed in Trinidad and Tobago when civilians attempted to carry out the Ashura rites, locally known as Hosay, in defiance of the British colonial authorities. The Sunni and Shi'a schism is highlighted by the difference in observance by Sunni and Shi'a Muslims. The violence is perpetrated by extremists. In countries that have significant populations of both sects, there is often violence during the holiday. On June 20, 1994 the explosion of a bomb in a prayer hall of Imam Reza shrine in Mashhad killed at least 25 people. The Iranian government officially blamed Mujahedin-e-Khalq for the incident to avoid sectarian conflict between Shias and Sunnis. However, the Pakistani daily The News International reported on March 27, 1995, "Pakistani investigators have identified a 24-year-old religious fanatic Abdul Shakoor residing in Lyari in Karachi, as an important Pakistani associate of Ramzi Yousef. Abdul Shakoor had intimate contacts with Ramzi Ahmed Yousef and was responsible for the June 20, 1994, massive bomb explosion at the shrine Imam Ali Reza in Mashhad." The 2004 (1425 AH) Shi'a pilgrimage to Karbala, the first since Saddam Hussein was removed from power in Iraq, was marred by bomb attacks, which killed and wounded hundreds despite tight security. On January 19, 2008, 7 million Iraqi Shia pilgrims marched through Karbala city, Iraq to commemorate Ashura. 20,000 Iraqi troops and police guarded the event amid tensions due to clashes between Iraqi troops and members of a Shia cult, the Soldiers of Heaven, which left around 263 people dead (in Basra and Nasiriya). On December 27, 2009, tens of thousands of opposition protesters in Iran demonstrated in conjunction with the day of Ashura. Clashes between anti-riot forces and demonstrators occurred in several Iranian cities. Among others, the nephew of the opposition leader Mir-Hossein Mousavi was killed. While Ashura is always on the same day of the Islamic calendar, the date on the Gregorian calendar varies from year to year due to differences between the two calendars, since the Islamic calendar is a lunar calendar and the Gregorian calendar is a solar calendar. Furthermore, the method used to determine when each Islamic month begins varies from country to country.